Spiritual Warfare | What is Spiritual Warfare? What is spiritual warfare? The Bible tells us that we are in a spiritual battle. The devil seeks to devour us, the world seek to engulf us and the old sinful nature seeks to enslave us. However, when we take up and put on the armor of God, we will be able to stand against the schemes of the devil, the subtleties of the world and the desires of the old sinful nature. Now that's spiritual warfare! Spiritual Warfare - What is spiritual warfare? Spiritual Warfare are the battles we face with the devil, the world and the old sinful nature. The following sermon highlights these battles that we face every day. There are three insights into winning the spiritual battles in our lives. They involve:? Introduction: As Christians, we are in a battle; however, our battle is not a physical battle but a spiritual battle. “Sooner or later every Christian—everyone who has made a stand for Jesus Christ—will discover that the Christian life is a battleground. As the old hymn says: Onward Christian soldiers, marching as to war, with the cross of Jesus going on before! Christ, the royal master, leads against the foe; forward into battle, see his banner go!. That hymn is a battle song. It depicts the Christian life as a battle. After all, did not the apostle Paul tells us that we are in a spiritual battle? Is this not why the apostle Paul said: “Put on the whole armour of God, that you may be able to stand against the wiles [schemes] of the devil...take up the whole armour of God, that you may be able to withstand in the evil day” (Ephesians 6:11, 13). We are involved in spiritual warfare; and if we are in a spiritual warfare, what is spiritual warfare? We can answer this question to some degree by looking at what is involved in our spiritual battles. Every day we face these three enemies in some way or another. Who are they? The apostle Peter said, “Your adversary the devil walks about like a roaring lion, seeking whom he may devour” (1 Peter 5:8b). 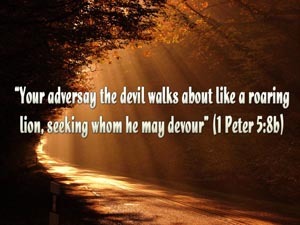 The word adversary means someone who opposes you. The devil opposes you. He is your enemy because he wants to devour you. He wants to destroy you...your walk...your testimony...your witness. The devil opposes you by throwing doubt on God's character so that you won't trust Him, by throwing doubt on God's word so that you won't trust it and by throwing doubt on God's power so that you will trust in your own resources rather than God's sufficiency. The devil, the world, and the old sin nature continually attack us on these two fronts. I doubt if you will go a day without fighting a spiritual battle on these two fronts. What are they? The first battle front is our personal holiness (1 Peter 1:13-16). The devil wants us to be defeated by sin. The devil does not want us witnessing for Jesus Christ. He will do all he can to defeat us in these two areas. Although we have three enemies and two battlefronts, God has not left us to fight the battle on our own. In fact, God has provided us with everything we need to defeat the foe so that we can live godly lives and witness for Him. What are these weapons that enable us to resist the schemes of the devil, the evil world system, and the desires of the flesh? The first spiritual weapon we have is the armor of God (Ephesians 6:11, 13). The armour of God helps us to stand our ground. But we must take it up and put it on. The armour of God prepares us for battle. The second spiritual weapon we have is the Word of God (Ephesians 6:17b). The armor of God is defensive weaponry; whereas, the Word of God is offensive weaponry. When we preach the Word of God, we call people out of darkness into the light of God. It is the word of God that delivers people from the schemes of the devil, the subtleties of the world and the desires of the old sinful nature. Remember the devil seeks to devour us (1 Peter 5:8b), the world seeks to engulf us (1 John 2:15-17), and our old sinful nature seeks to enslave us (1 Peter 2:11). However, when we take up and put on the whole armour of God, we will be able to stand against the schemes of the devil, the subtleties of the world, and the desires of the old sinful nature.